Marine biodiversity data are essential to measure and study the ecosystem health of maritime basins. These data are often collected with limited spatial and temporal scope and are scattered over different organizations in small datasets for a specific species group or habitat. Therefore there is a continuous need to assemble these individual datasets, and process them into interoperable biological data products for assessing the environmental state of overall ecosystems and complete sea basins. 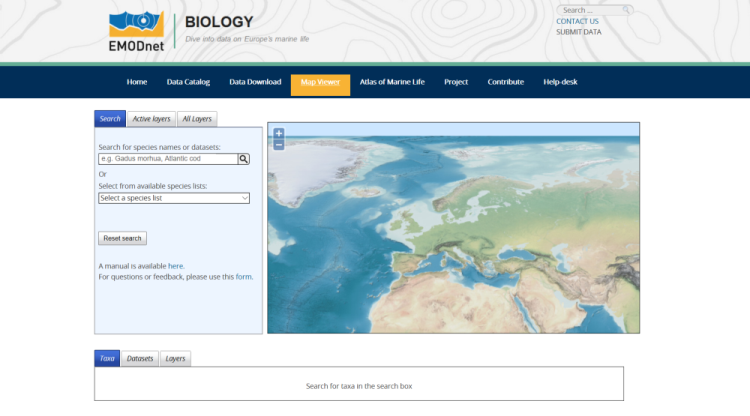 One of the main objectives of EMODnet Biology is to allow public access and viewing of data, metadata and data products of marine species occurring in European marine waters through the EMODnet Biology Data Portal. The EMODnet Biology Data Portal is developed and maintained by the Flanders Marine Institute (VLIZ). A set of gridded map layers will be produced showing the average abundance of at least three species per species group for different time windows (seasonal, annual or multi-annual as appropriate) using geospatial modeling. The accuracy of the method will be quantified, as well as the precision of the specific results and data used to calculate the products. In addition, spatially distributed data products specifically relevant for Marine Strategy Framework Directive Descriptor 2 (non-indigenous species) will be created. It will receive additional environmental information from other lots of EMODnet, e.g. on benthic habitat characteristics and water masses, to be used as co-factors in the gridding. More detailed information about the EMODnet Biology data products and services can be read here.